My friend Eden Bennett gave me this recipe for Giant Oatmeal Chocolate Chip Cookies about 100 years ago. 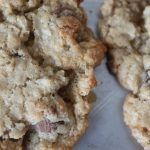 I think it’s the best Oatmeal Chocolate Chip Cookie recipe. Oh, make sure you have some milk chilling. You’ll need a big, tall glass. Cream butter and sugars. Add eggs and vanilla, beat until no longer grainy. About 3 minutes. Combine all dry ingredients in bowl. Mix in a little at a time to wet ingredients. Do not over mix. Blend just until wet and dry ingredients are combined, You may also mix by hand to prevent over-mixing. Fold in chocolate chips. Scoop dough onto one large jelly roll pan, using a 2-3 inch cookie or ice cream scoop. Place cookie dough onto pan, closely together until all of the dough is scooped out. You should have approximately 36 balls of dough. Cover pan with Saran wrap and place in refrigerator for at least 2 hours or until dough is chilled completely. Place dough onto cookie sheets, no more than 6 cookies per pan. Slightly flatten top of cookie with spatula or palm of your hand. Remove from oven and let cookies cool completely on baking sheet. -I like the flavor of Guittard Milk Chocolate Chips. The Guittard chips are also larger than a standard chocolate chip.-To bring the butter to perfect temperature, remove from refrigerator and microwave 1 cup (2 cubes) at a time for 15-20 seconds. Or set on counter for about 30 minutes. Excellent these cookies. Great with a cup of tea. Well done! If I find out that you made these and didn't share them with me, I will be really really upset. My all time fave type of cookie. Hi Susan, of course! Sorry, I forget that readers from far away places cook along with us! The cups measurement is about 2 cups total. Happy Baking! So- these were the best! So big and the guittard chocolate chips make a big difference. Also, I ended up with so many- lots to eat , share, and freeze. I don't know that I can ever bake plain chic chip again! These are amazing!! Made them for my cousin who just had twins and she commented again that many people had brought cookies but her and her husband both can't get over how good these were! Love your blog! I make CCC's all the time, and they are almost always delicious. But for some reason, every time I make oatmeal cookies, they are flat. My only thought is that I need to add more flour? I'm going to make these today, with hopes that, since we're baking at the same altitude and your recipes never let me down, I'll be successful. What do you think I've been doing wrong when it comes to OCCC's? Crystallina, I'm not sure if you have or have not tried this recipe? I have had great success with the cookies not being flat using the amount of flour in this recipe. Also make sure you do not over beat or over soften the butter . If you refrigerate the dough it will also help with dough not flattening out. Try baking one pan and see. I scoop into a ball, slightly flatten with my hand and bake as directed . Let me know! If the cookies still seem too sticky add another 1/4 cup of flour and barely mix in. One more tip. I NEVER. Turn my Mixer on above the lowest speed while making cookies! Si, do you put your creamed butter/sugar and egg/vanilla mixture to the side at room temperature for a few hours? Or in the fridge? Thanks in advance for your help! After you make the dough, then refrigerate the whole mixture. I scoop into balls first, then refrigerate. At least two! if you make the cookies smaller, do you need to adjust the cooking time? If you make these cookies smaller, try 375 degrees for 8 minutes. Do a test run with just one cookie and see how you like the results, then adjust accordingly. Look for the top of the cookie to lose it’s shine. After you pull them out, leave on the cookie sheet a few minutes before removing. Let me know how that works for you! Just curious, do you ever grind the oatmeal into flour à la the $250 Neiman Marcus famous chocolate chip cookie recipe? I tried that recipe years ago, and I remember it was a good one, haven’t posted it here on ABK. You could definitely use that method in this recipe!